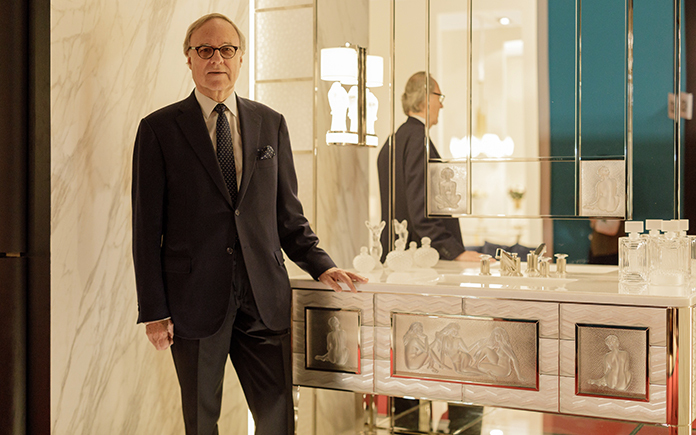 Devotees of the high-end furnishings scene recently glimpsed a preview of an exciting new collaboration, with the announcement at Milan’s Salone de Mobile of the Signature Collection by Lalique and Pierre-Yves Rochon. 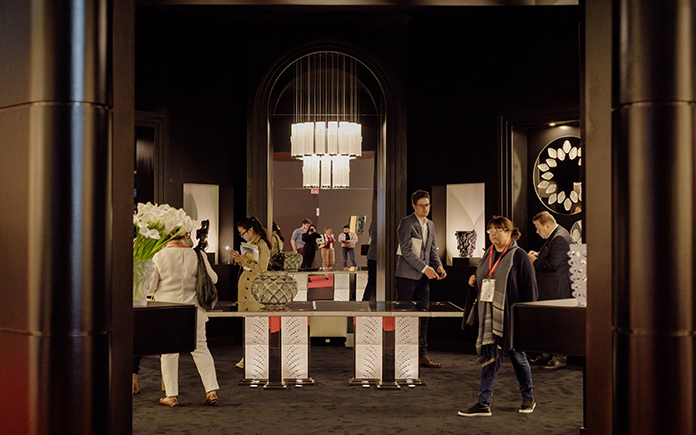 Aimed firmly at buyers for whom luxury always trumps expense, the collection combines the trademark crystal and glasswork excellence of Lalique with the distinctively French design sensibility of Rochon. The four-piece collection will weigh in at a staggering €348,000 to purchase, but this figure reflects the exceptional pedigrees of both parties in the collaboration, as well as its limited edition nature. 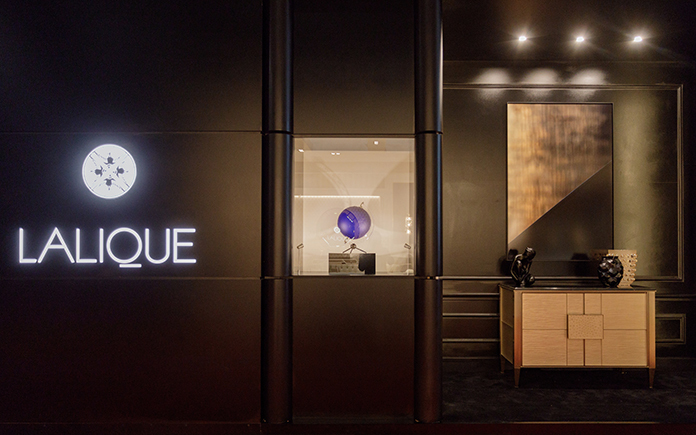 Lalique is renowned across the world for their glasswork, producing luxury, artful items across the spectrum from perfume bottles to high-end jewelry. Founded in 1962, they are now perhaps best known for their exceptional crystal pieces, and are famed for focusing just as strongly on beauty as on function. 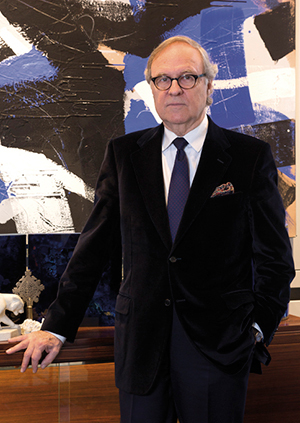 Pierre-Yves Rochon is considered to be among the royalty of French interior designers. 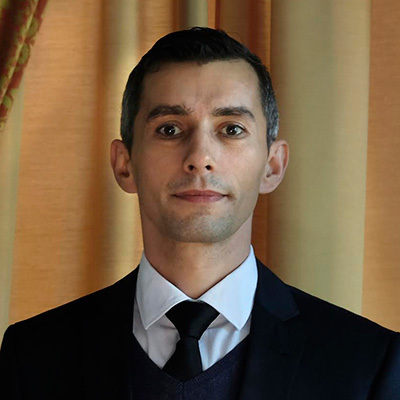 His company, founded in 1979, has been the creative force behind the outfitting of some of the biggest names in luxury hotels and restaurants across the planet, with a resumé boasting collaborations with the likes of Ritz-Carlton, Savoy, Joél Robuchon, and Alain Ducasse. “I have always admired René Lalique’s creativity and talent. With subtlety and excellence, he managed to perfectly marry the purity of glass with the precision of metal. As an Interior Designer, it is an inexhaustible source of inspiration and creativity. With this new Signature collection of furniture, I wanted to write a new story in which metal sublimates the transparency, purity and brilliance of crystal. The Vibration, Causeuses and Coutard pieces were born from the quest for the most beautiful aesthetic effect, the search for perfect proportions and the attention to every detail. Marked by the precision and the elegance of metal, the designs give crystal the freedom to blend in interior architecture and furniture design in a new manner. Considering the heritage of these two luminaries of furnishings and design, it’s clear that the new signature collection will offer something truly special and luxurious. The collaboration consists of four main pieces. 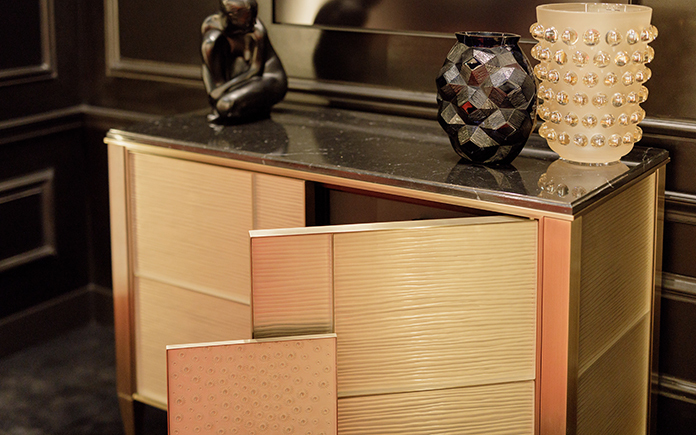 The Vibration Commode / Dresser, as one would expect from Lalique, makes heavy play on the beauty and luxury of crystal. Combining refined aesthetics with real functionality, this dresser is a perfect pairing of clean, minimalist lines with an opulent crystal and marble finish. The exterior structure is plated in bronze with a black-veined marble top, while the interior and drawers are fashioned from blackened pear wood finished in soft black leather. 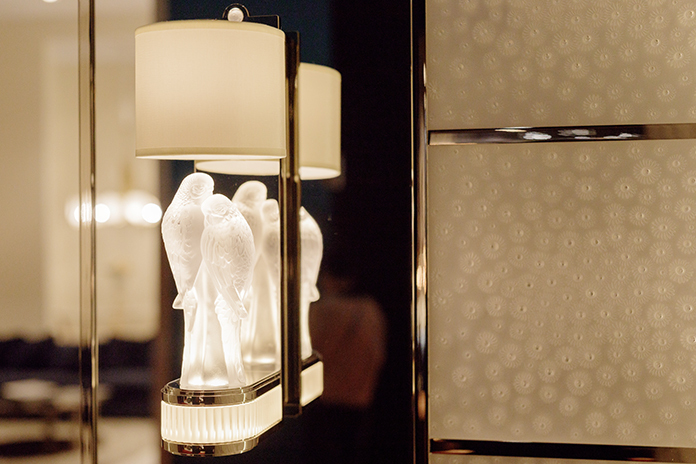 Each of the twelve pressed-crystal plates bear the Lalique France signature. The Causeuses Vanity table is a celebration of feminine beauty, with its satin-finished crystal evoking the velvet texture of perfectly pampered skin. Finished in bright nickel with a Névé White marble basin, the Causeuses Vanity also features three crystal panels with nickel backing, plus a further 32 Soudan hand-cut crystal panels adding an expressively luxurious touch. 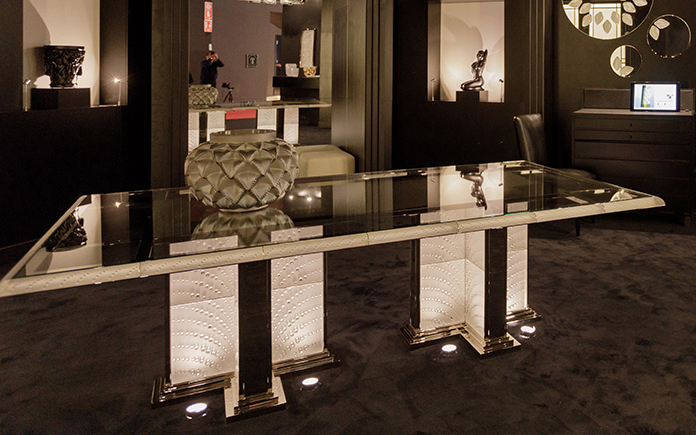 Continuing with the strong crystal theme, the Coutard table would form the centerpiece of a stunning dining room. 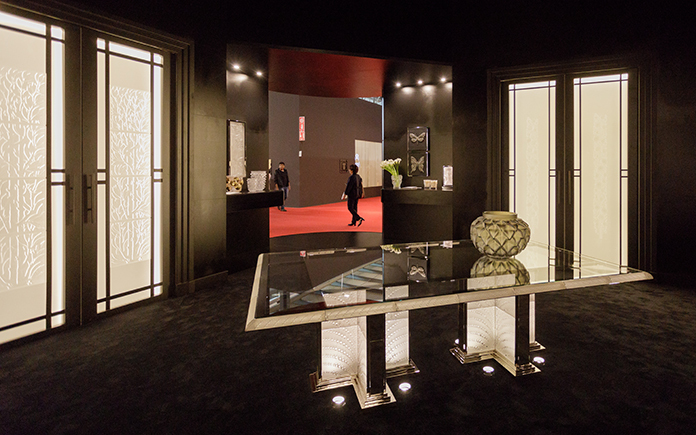 Mirrored Coutard crystal panels clad the bright nickel base, while the extra-white glass table top is framed by a border consisting of 22 crystal elements with nickel highlights. The standard-sized table seats eight diners in splendor, although a half-size option is available for more compact requirements. No matter how grand the main elements of a room’s furnishings may be, it’s often the smaller touches which perfect the atmosphere. This role is easily fulfilled by the Perruches Applique wall sconce, which approaches the necessary function of lighting with a wholly sensual degree of style and finesse. Each piece consists of a beautifully designed nickel mounting, with an illuminated crystal base, an eye-catching Perruches crystal focal ornament, and a further crystal knob above the ivory silk lampshade. The collection will be offered for sale from October 2017 in Lalique boutiques from New York to Paris, and pre-ordering is also possible to secure ownership of these highly exclusive and desirable furnishings.